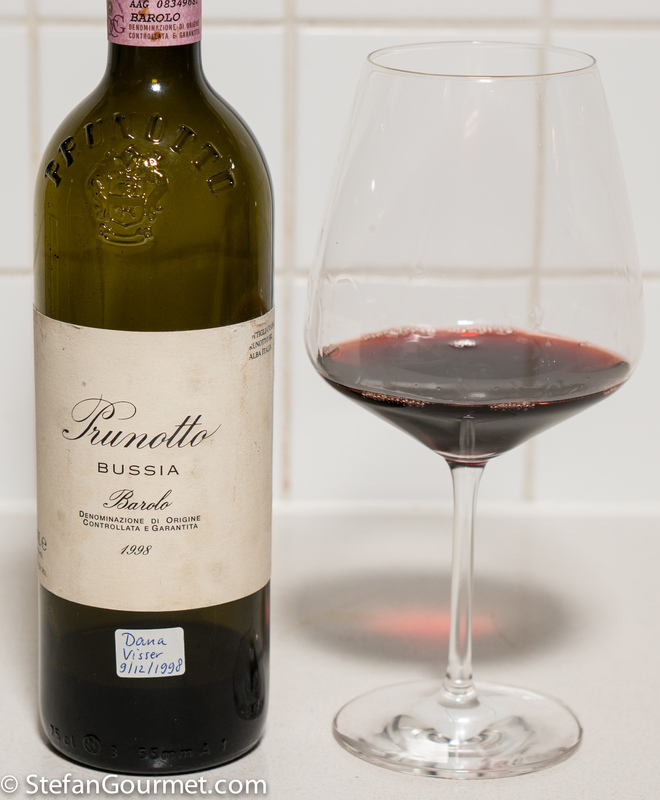 Another niece turned 18 and so it was time for another bottle of the same 1998 Barolo, but this time for Dana. 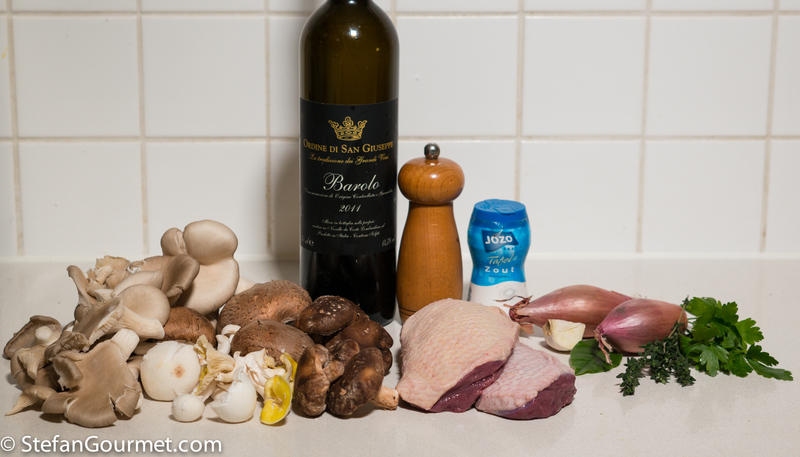 I thought it would be nice to cook something with duck breast for her, which already works with Barolo, but would work even more with some mushrooms added to the mix. And so that is what I prepared. This dish is relatively simple, yet delicious and elegant and perfect for the holidays. 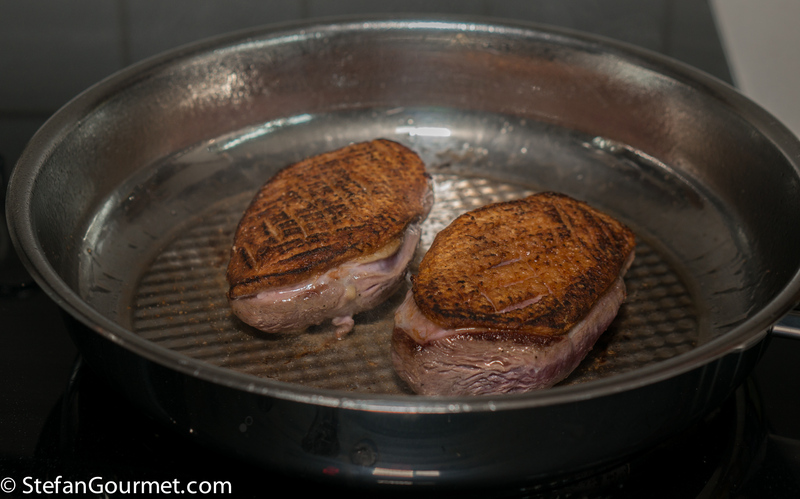 Cooking the duck medium rare is of paramount importance to make it tender and tasty. For best results, you can finish cooking the duck sous-vide or in the oven. For the latter you should use a thermometer with a probe to avoid undercooking or overcooking the duck. Note that no butter or oil is used for this recipe, everything is cooked in the duck’s own fat to get maximum duck flavor. 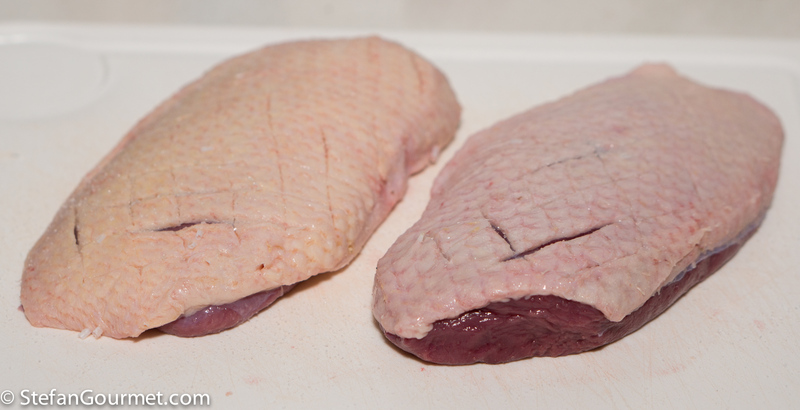 With a sharp knife, carve a diamond pattern in the skin/fat side of the duck breast. Make sure to cut only the skin, not into the meat. Season with salt on both sides and with freshly ground black pepper on the flesh side. 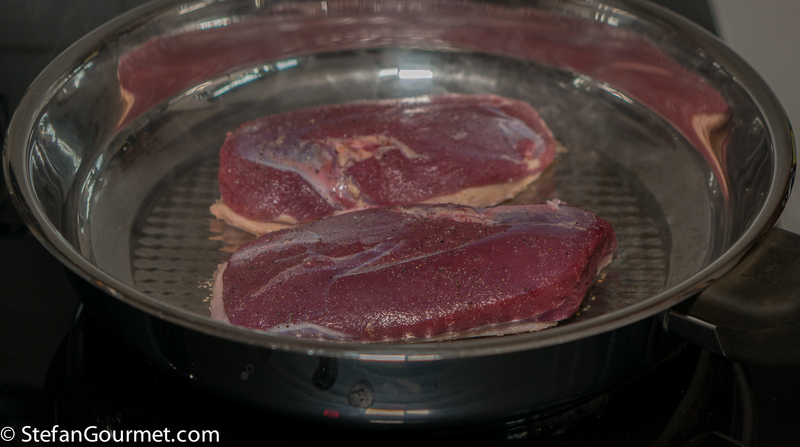 Heat a frying pan over medium-high heat, then heat the duck breasts, skin side down. There is no need to add any butter or oil, as fat will render from the skin. Cook until the skin is deeply browned (but watch out that it doesn’t burn), 3 to 5 minutes, then turn over and cook for 1 minute only on the flesh side. Take the duck out of the pan. 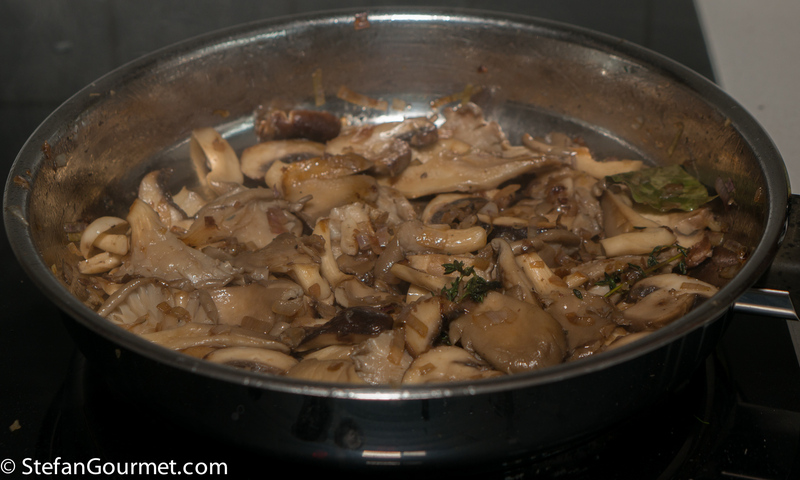 Keep the pan with the duck drippings, as they will be used for cooking the mushrooms. To cook sous-vide, set the duck breasts aside on a plate to cool. When the duck breast has cooled, vacuum seal and then cook sous-vide for 2-4 hours at 57C/135F. 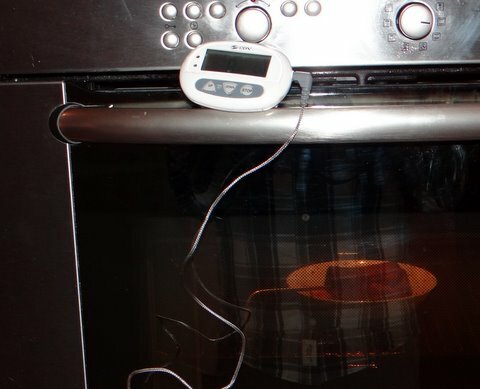 To cook in the oven, use a thermometer with a probe and cook in a low oven (120C/250F) until the core reaches about 55C/131F. Then take out of the oven, wrap in aluminum foil, and allow to rest for 10 minutes. 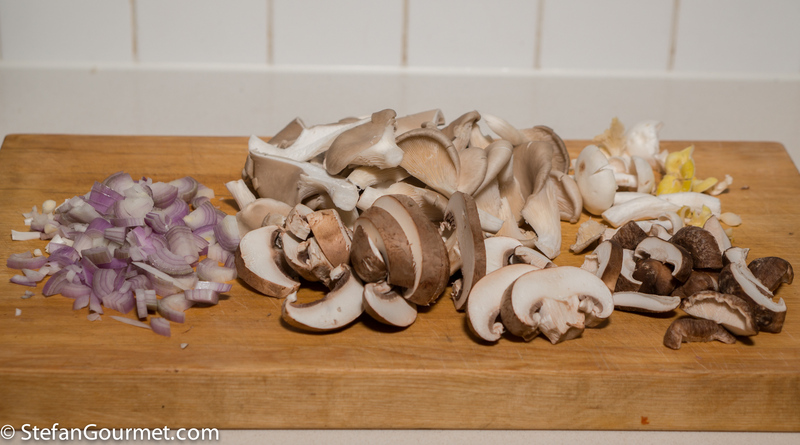 While the duck is cooking, slice 2 shallots and 450 grams of mixed mushrooms. 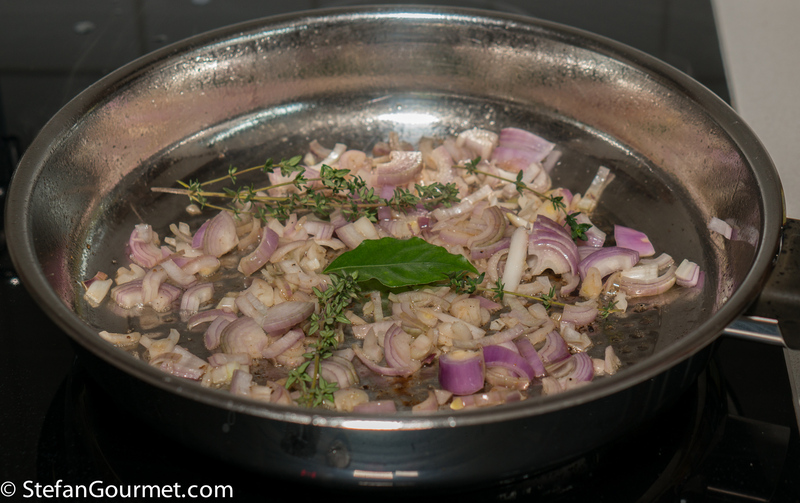 Put the shallots in the frying pan with the duck drippings, together with a bay leaf and some fresh thyme. Season with a bit of salt. Stir over medium heat until the shallots are golden. 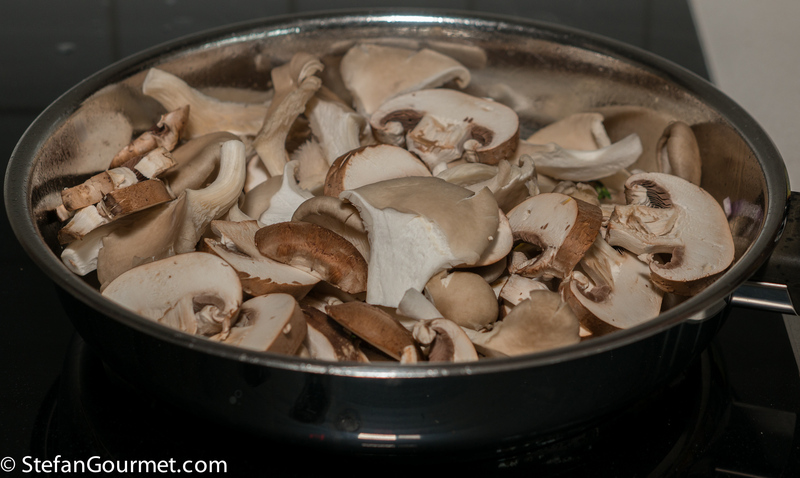 Cook over medium heat, stirring, until the mushrooms are cooked. 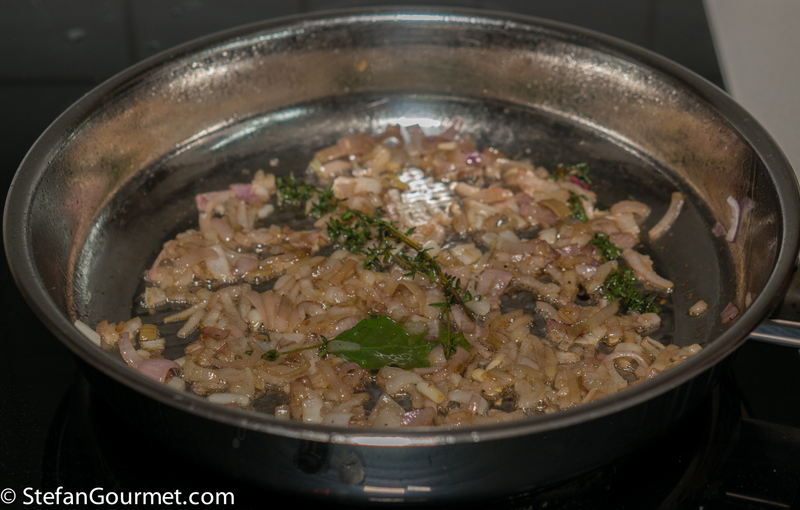 Add a tablespoon of minced parsley and a minced clove of garlic, and stir for a minute. Do not allow the garlic to brown (as it would turn bitter). Add about a third of a bottle of red wine. 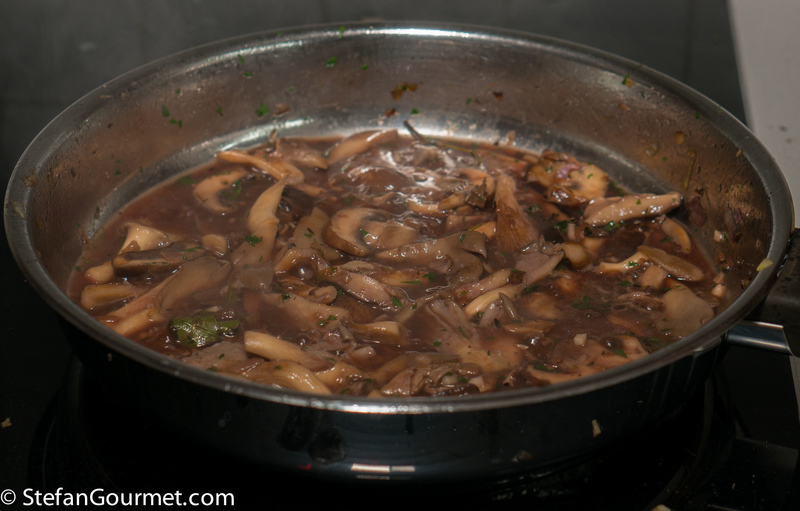 Simmer until most of the wine has evaporated or been absorbed by the mushrooms. Taste and adjust the seasoning with salt and freshly ground black pepper. 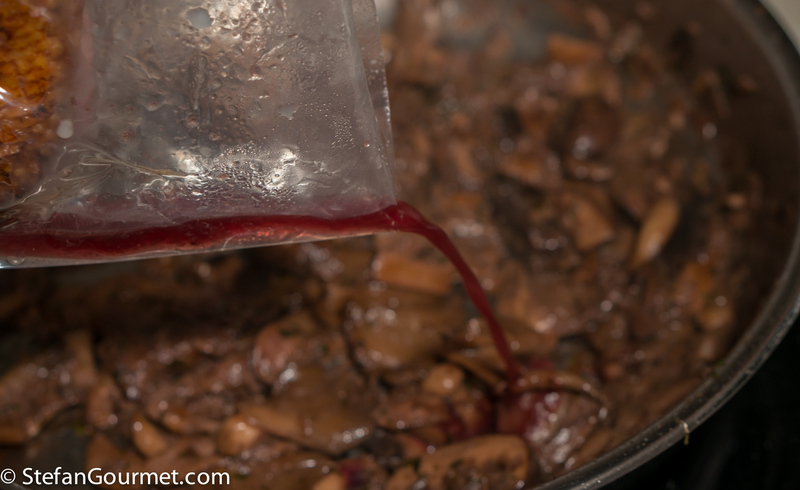 When cooking sous-vide, add the juices from the bag to the sauce and stir briefly over medium heat to incorporate. 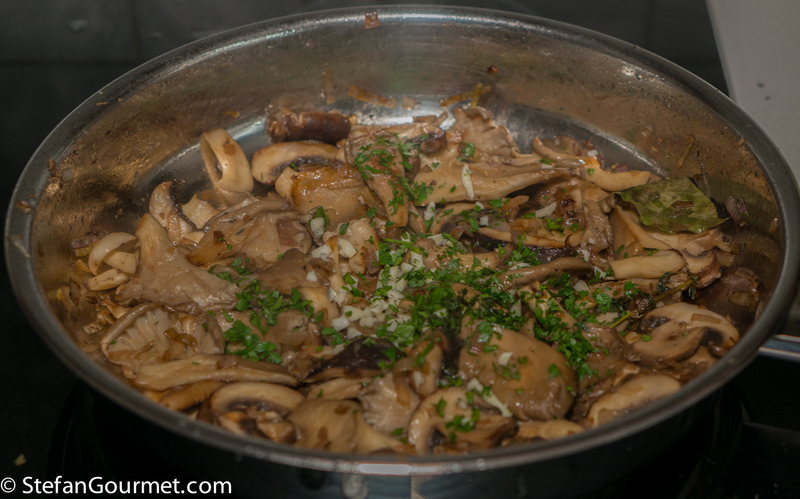 Slice the duck and serve with the mushrooms on preheated plates. Season the duck slices lightly with salt. 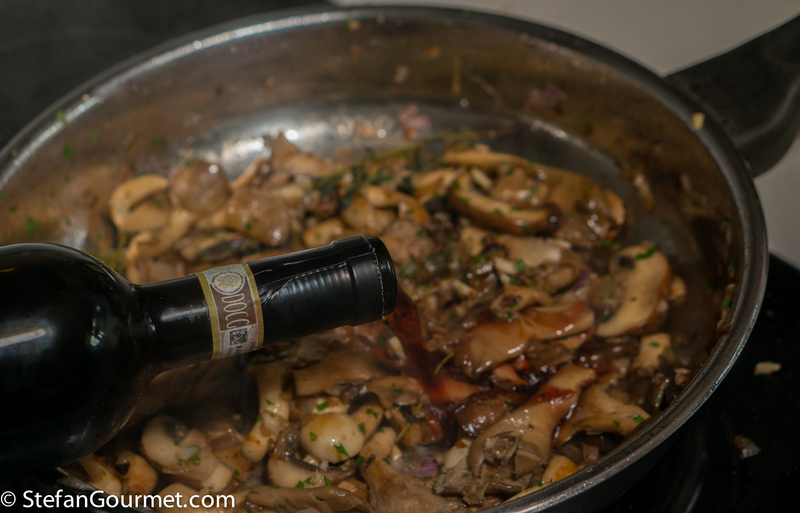 The 1998 Barolo worked very well with the duck and mushrooms. 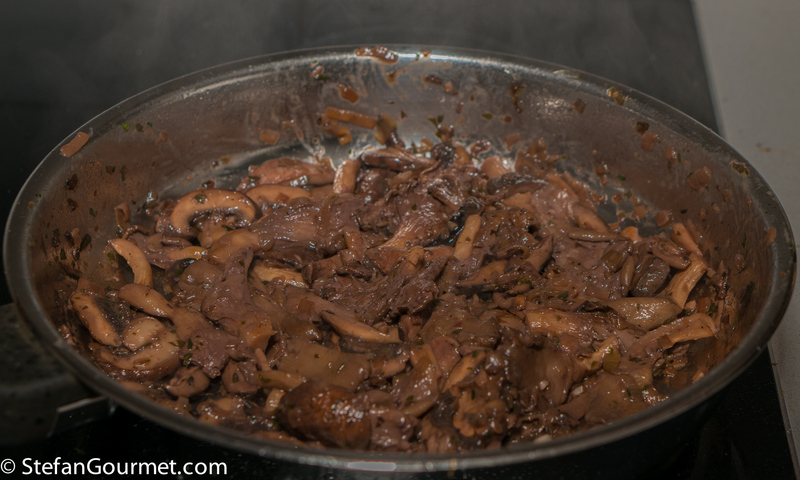 The medium rare duck helps with the tannins in the wine, and the earthiness of the mushrooms works well with the earthiness of the wine. 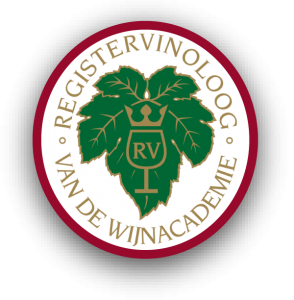 Many other earthy (not too fruity) red wines would work with this too, like a full-bodied red Burgundy for instance. 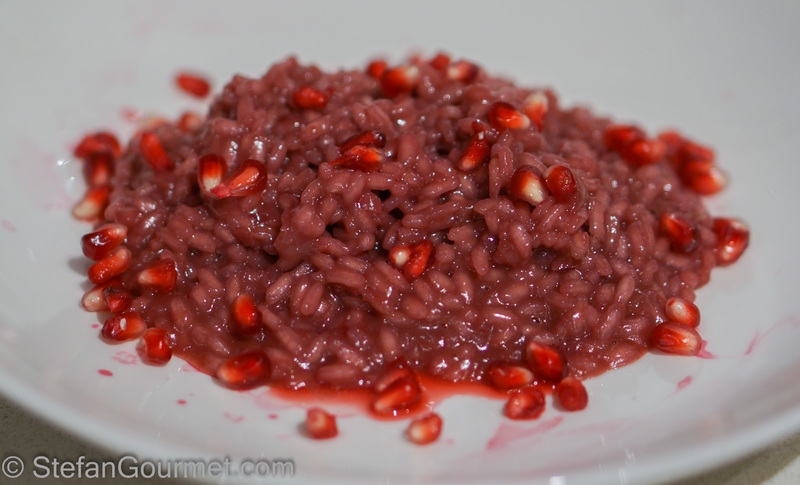 If you want something special for Christmas, how about pomegranate risotto. It certainly looks great and it also has a unique flavor. Add something green to make it look even more like Christmas. This looks very good. The duck is perfectly cooked. Thanks, that’s what sous-vide will do every time. Just bought a whole duck today 🙂 Yours looks great ! Cheers ! My son would adore this, and I would love it too. Love your stuff. Thanks for all the photos of each step! I see some sous vide recipes say to cook 135degF for 30 minutes, not just reach that temperature. What your opinion? Cheers. 30 minutes is a bit short to cook a duck breast, as in such a short time the core of the meat may not reach the desired temperature (this depends on the thickness). I prefer to cook duck breast longer than needed just for it to reach the desired temperature to the core, as this will tenderize the meat. Duck breast can be a bit tough otherwise. This is why I cook duck breast for 2 to 4 hours. Thank you for the alternative of cooking in the oven, low temperature. 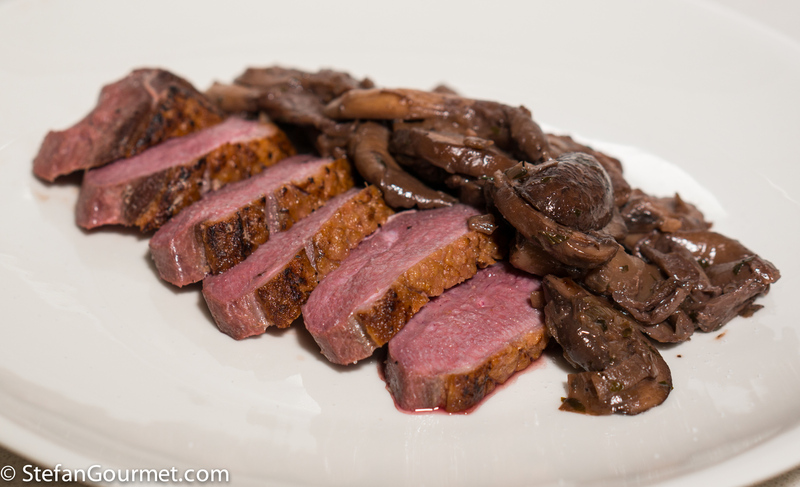 I will try this, as I like duck breast and mushrooms. Lucky girl the niece who can taste such a Barolo for her birthday, auguri! That is one birthday dinner I’m sure your niece will never forget. What a lovely dish, Stefan. It sounds delicious! Thanks, too, for including oven directions. I know I would have set the oven temp too high and probably ruined the breasts if left to my own instincts.